It seems like every which way I turn there is water in my life. I grew up on a small lake in Northville and spent all of my summers swimming in it every day (after my parents made me take every swim lesson and pre-team possible to make sure I was a strong swimmer). I refused to be on the swim team – staring at a black line all day seemed too boring but somehow that pool drew me back in. I started teaching swim lessons and lifeguarding in high school. I attended The University of Michigan where I received a degree in Kinesiology (exercise science) and worked for the university in the summers doing the swimming lessons at the sports day camps. I had thoughts of being a physical therapist but every time I went for a job interview, they wanted me to work in the pool….so in 1995 I took a job and ran the swim lesson program at Beverly Hills Racquet Club where I also started a USS team. In 1998 I moved to The Sports Club of Novi where I ran their Learn to Swim program for 16 years (tried to get a job as their aerobics coordinator first – ended up in the pool there too), putting over 2000 kids through our lesson program each year and hopefully onto our USS team. In 2007 I discovered the MAC team and finally gave in and started swimming competitively; I met some friends and wasn’t so bored looking at that black line any more. I fine tuned my strokes so they were at the competitive level and started to really be a swimmer. 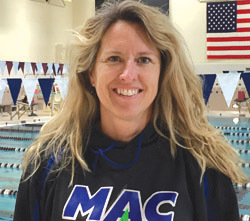 As I became more involved in MAC I was tapped for first the Middle School swim team at Huron Valley and then eventually the high school girls’ team at Milford High School where I’ve been for five years now. I stepped up to become an assistant coach of MAC in 2012 as the team began to grow. Summertime sees me still outside – a job change in 2014 took me to Walnut Creek Country Club where I’m the Pool Manager and also the Head Coach of the Whitecaps Swim Team. When not in or around the pool I enjoy waterskiing, SUP, running, yoga, reading a good book, and spending time with my husband and four kids. The highlight of my swimming career was at the 2016 State Meet when I won the High Points Award for my age group. I love to work with swimmers of all ages and bring my background of motor learning and biomechanics into play – it’s wonderful to see when something clicks in a swimmer and the smile they have on their face from learning something new!